A story about discovering a dream and finding freedom. We had both just moved to Kansas City to start working at a corporate job at a healthcare IT company. Austin and I became friends at our company’s orientation and we started hanging out, partying, and playing video games. We were both new in town and happened to live a mile or so apart. He was an iOS developer and had a few years of work experience, I was a fresh grad from Indiana University’s Human-Computer interaction and design program. Neither of us realized we would eventually combine our skills to start a video game company. I am grateful to have found a motivated co-founder that I can be friends with and also work with, a harmony that I understand is quite rare. On a cold winter weekend in 2013 we were recovering from our demanding corporate life. My memory is fuzzy on the exact conversation, but we decided that we should try making a mobile game. Austin already had some experience making small apps and I had some design experience. We had seen indie game the movie, and I think we were subconsciously unlocked. We could make games too if we really wanted to, we would just need to stay passionate and persistent and give it all we had. We recognized that successful artists don’t give up easily. Our first game was inspired by a movie called “The Grey” by the universally recognized badass Liam Neeson. In the movie Liam continually stares death in the face when his plane crash lands in a snowy mountain range. As soon as we started putting together some ideas and prototyping, the seed of an idea started to grow. We created a simple winter themed action-platformer on iOS which we named Yukon Warrior. We sacrificed many weekends and weeknights chipping away at this novice sculpture of a game. For me, making games on the weekends and weekdays felt like an escape and a creative release. I was unhappy with many things going on in my life, but working on Yukon Warrior felt important. This first game took 1 year to create part-time and we made around $200. This barely covered the AppStore developer fee. In the process of creating Yukon Warrior, I could feel the passion and dream being cultivated. It was a slow process that grew with every goal being accomplished. We didn’t meticulously plan any of this out, I don’t think many things in life work that way. *We removed Yukon Warrior from the AppStore in 2016. 6 months before our 2-year mark at our corporate job, we discussed leaving and becoming full-time indie game developers. For many it’s terrifying to leave a secure income for something as unpredictable and volatile as the game industry. Being “young” and without dependents, I was not very concerned and I was happy making games. By the time we left the corporate world all we had was a decent prototype of our next iOS game. We saved our money and moved into an inexpensive apartment in Bloomington, Indiana (my hometown). Our budget and overhead was lean. 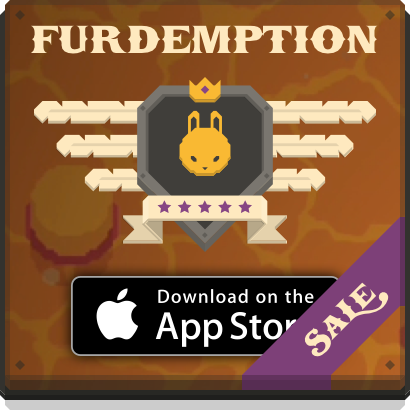 After working furiously for 5 months full-time we released the iOS game Furdemption in June, 2015 . It was released as a $3.99 premium app and was featured by Apple in best new games. It did OK for an indie game, bringing in a little over $20k in proceeds. It took over a year to develop Furdemption and our savings were dwindling fast. $20k between us didn’t give us much time to create a new product from scratch. I would consider Furdemption the seed of our indie success but commercially it wasn’t enough to sustain us for long. We were in a tough spot — we needed to create something with high value as fast as possible, or we’d have to go back to slinging code and pixels for someone else. We had a petite fanbase and we knew players loved Furdemption. We decided the best move was to make a bigger and better sequel. We spent 9 months of grinding and sometimes neglecting other aspects of our lives to bring this sequel to life. The bank accounts were dried up. In March, 2016 we released King Rabbit. A fresh theme, new levels, and tons of improvements. 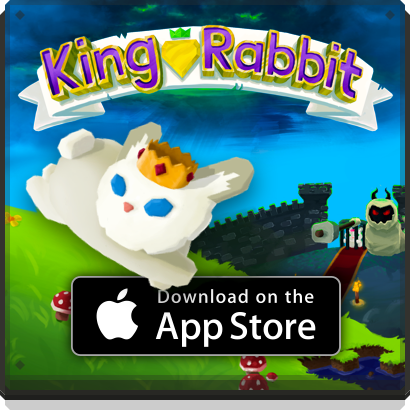 King Rabbit started as a paid app with optional In-App purchases like level hints and customization options. We eventually made it F2P (Free To Play) and added occasional ads in-between levels. These business model changes weren’t planned from the beginning but we pivoted as the game evolved. Transitioning to F2P turned out to be a good move and King Rabbit turned out to be a small indie success. In 2016 we had over a million downloads and our net income for 9 months exceeded $100k. With a little more experience and success under our belts, we wanted to start developing another product. Austin and I had been working on the same codebase for the past few years and were ready for something different, but at the same time we really wanted King Rabbit to thrive and not disappear into obscurity. The biggest problem with King Rabbit at this time was the content bottleneck. We’d spend weeks and months building levels to have players complete them in a single sitting. At this point King Rabbit only had 256 levels. To solve this problem we decided we should take the time to build out and release a level builder. This would make King Rabbit a deeper experience where you can exercise your creativity. I think many developers would have chosen to move onto the next game, and we almost did. Creating a level builder with good production quality takes a ton of time and effort and we weren’t positive if people would actually want it. It took us nearly a year to finish the level builder. The level builder was released for free on January 26, 2017. Like compounding interest, the value of the builder tool slowly grew. As of July 2018, 22,932 levels have been published and continues to be active. The digital nomad life abroad began. We attended the Game Developers Conference in San Francisco in 2017. Immediately after this conference Austin and I drove down to Puerto Vallarta, Mexico. I rid myself of all material possessions except for two bags and a carry-on.. I love idea of being light on my feet and I enjoy the freedom to work how and where I want… At this point I’m figuring things out one step at a time. Well written! Your passion will drive your success no matter how long it’s going to take, no matter how much it’s going to cost, and no matter how hard it’s going to be. Y’all are passionate about this so I know it will succeed. You’ve made the right decision. Let me know when you reach a stationary address, I’ll be sending you a bottle of Rivulet!